They’re barely as high as a Space Marine! First off, my favorite demonkin. So far I have completely cleaned up all Nurgling piles of mould lines which means they’re ready for priming and painting right after I set them on paint sticks. I marked the bottoms again to see which pile needs what part. Aren’t they adorable? Recommended to anyone who will put these babies together. 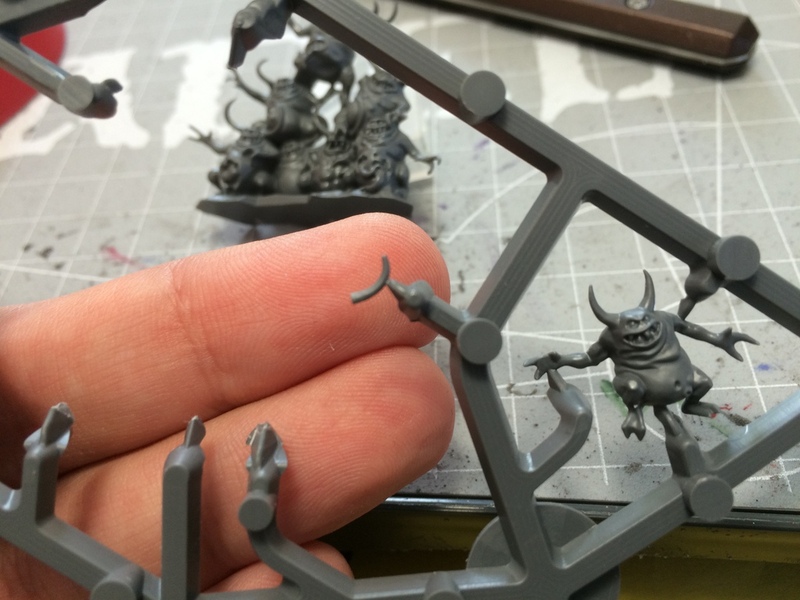 Some of these Nurglings have interesting joining points. I’m pretty sure that GW wants us to paint them after assembly now that I see that some horns and arms have separated due to this design, however I’m not really keen on doing this. I’ll be painting each of the 3 pieces individually and then assemble them. Perhaps I can visually disguise the join lines after final assembly with some darker skin shades. The GW paint job on the online shop is quite stellar and I like that they used varying shades to introduce some much-needed variety. A good point to pick up from. An arm and a … horn? Fits nicely but really needs some putty work if you want a perfect finish. One problem I had here is that one of the horns broke off at some point during handling the models and I ran into it while clipping the pieces away. Not the end of the world and can be fixed with a bit of glue but still made me wince. I’d like to sit down for a talk with the designer who thought it was a great idea to connect pieces on delicate parts. Genius! Yep, that’s an air bubble. Even the mighty plastic gets them it seems. 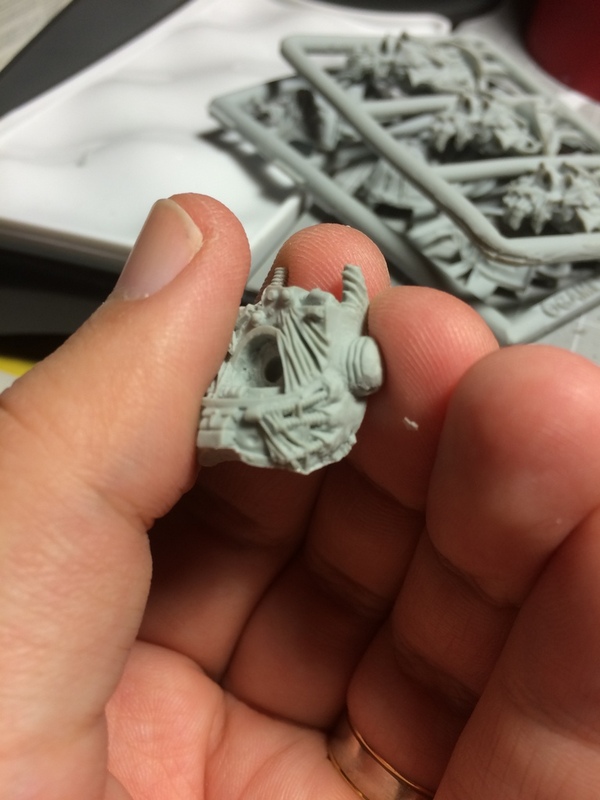 Connecting the sprue with the model on a horn is BAD. OK, I’m pretty sure I’ll be marked a heretic (on modeller’s terms) for saying this but I’ll do it anyway. I love resin kits! They come neatly packaged, which was a refresher compared to the bare sprues in boxes in plastic kits. 5 40mm bases for 3 Obliterators? Thanks, I guess? 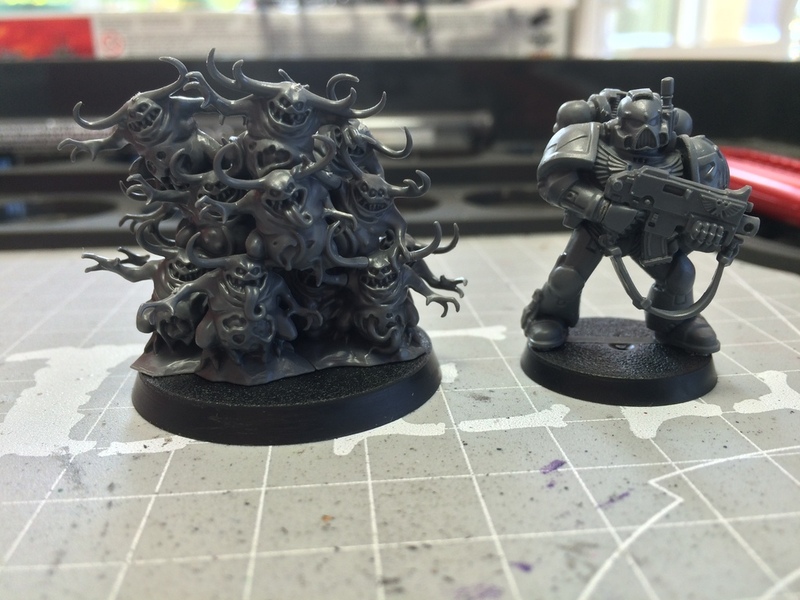 When I first saw that the Obliterators and the Mutilators are Finecast I had my minute of doubt but once I saw the amount of detail on them I was instantly sold. I’m a fan of sculpted details, what can I say? 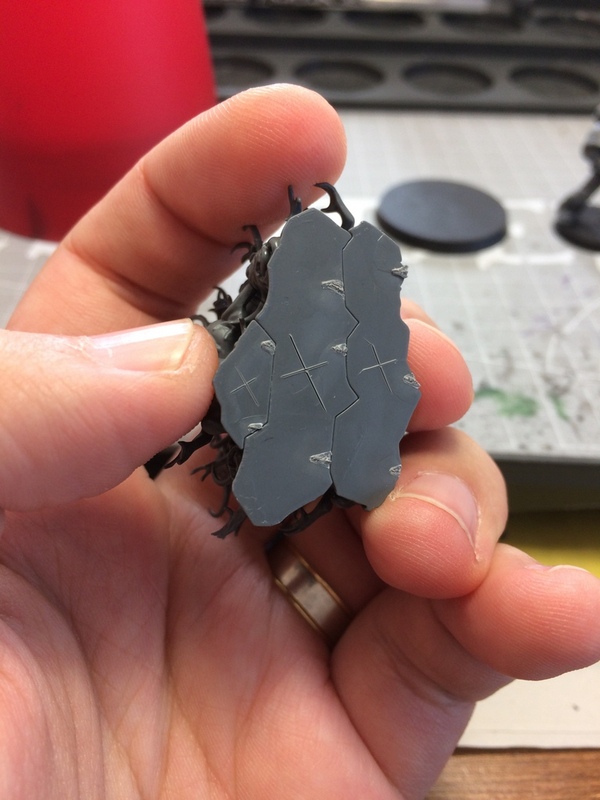 Of course, the main reason people avoid Finecast like the plague is the notorious amount of miscasts, air bubbles and the general difficulty of working with resin. It is, after all very brittle to handle normally, acts as a serious irritant when in dust form (careful with sanding resin pieces) and requires some serious work to bring it back to shape. 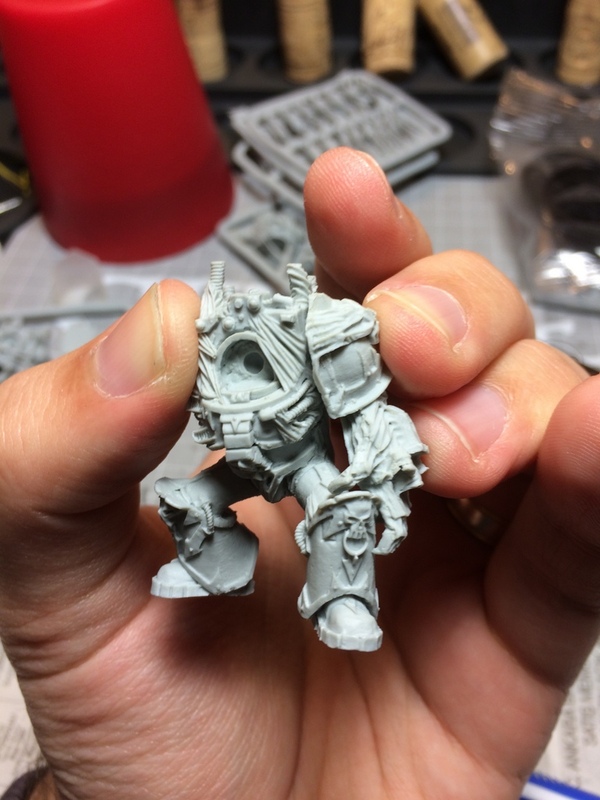 I consider myself lucky when I say that there’s little miscasting issues on my models and only a few broken pieces that are practically unavoidable during international shipping. Just have to be positive about this and perceive it as an extra challenge to be overcome. Here’s a few shots with errors and what I found is wrong with them. There’s a lot of flash on the models. Check the box art carefully and separate these annoying pieces with a knife. There are tiny bits of resin on flat surfaces and some bubbles. Identify them, eliminate them. It may be a good idea to sand the feet (in a well ventilated room to avoid resin dust) in case you’re sticking it to a base. I’ll be pinning the model so some time saved at least. There are some vents on the details that are difficult to remove. All I can advise is to be careful and work slowly. Here’s my loss. The chain is missing some piece of the link. Maybe I’ll be able to mask it away as battle damage of sorts. A more difficult mould line. Dented armor or miscast? Difficult to tell with Obliterators. … and more bubbles on the bottom plate. The dreaded mould lines! Resin is softer to work so just gently scrape them off with a tool. … and it’s fixed. Mostly. Ah yes, we have a join line. Fix them with either a putty or sand the surfaces, just enough to fit the parts. The fingers also have some vents. They break off at first application of the knife, no resistance. The pieces are pretty static which allows for working with sub-assemblies. So I attached the torso to the legs. After washing with soap water, the pieces will be ready for pinning on cork caps for priming. I also have some progress on the Chaos Terminator Lord but have no pictures of him at the moment. I’ll tackle this on the next update, hopefully with some paint slapped on. So, stay tuned for more Chaos goodies. Woo!!! Nurglings! I wouldn’t worry too much about the broken horn. It’s daemons. It’s perfectly natural to lose a few bits here and there :). As always, your prep work is inspirational. Definitely been stealing some of that inspiration in my own models as I scrape away. Thanks for that! Looking forward to all the wonderful paints you’re going to cover these models with!